Arsenal 2-0 Hull City: 5 Key Points From the Win. Regardless of the performance, Arsenal have returned to winning ways with a 2-0 win over Marco Silva’s resurgent Hull City. The game was scrappy and the Gunners toiled for the three points, but the win was the only thing that mattered, especially with Bayern Munich looming closely next week. After back to back losses to Watford and Chelsea, the league table made depressing viewing. With Chelsea off in the distance, the hunting pack were either getting their noses in front of us, or breathing down our necks. Points were needed and Arsenal duly obliged. The team did not alter much from last week’s defeat against Chelsea, with only one change. Kieran Gibbs came in for Nacho Monreal on the left of defence, but the rest of the team were given the chance for redemption, or part absolvement. The first half was a messy affair, but there was no shortage of effort. Arsenal were at least haring around the pitch, when chasing for possession or trying to conjure an opening. Hull City are a much more formidable outfit than a month or so ago, and they were not content to sit back and soak up pressure. Oumar Niasse was testing the relaible Koscielny, and his header which Petr Cech saved well from was the first opening of note. Arsenal tested Eldin Jakupovic in the Tigers goal immediately, but it wasn’t until the 34th minute that the Gunners’ slowly upped pressure would tell. Kieran Gibbs had popped up in the opposition box, and his shot was blocked. The ricochet went unclaimed in the six yard box, where the quickest ro react was of course Alexis. He stabbed toward goal, but Jakupovic managed to parry the effort. Alexis had chosen to follow up his effort and the combination of Jakupovic’s save and Alexis’s forward momentum saw the ball hit the Chilean’s hand. There was little he could do, but the ball went over the line and he wheeled away to celebrate. So, according to the letter of the law – it was not a deliberate handball. That is that cleared up then. Arsenal pressed for a second, but the half time whistle blew and we had a lead to protect. The second half saw some handbags between Theo Walcott and Harry Maguire, where Theo was mystifyingly booked, and the pressure was rising quickly from the home team. It would be Hull that would go closest next though. Lazar Markovic was chasing a flick on, and the ball was in the air. He slowed to chest it down, and Kieran Gibbs was his sole marker. He shouldered Markovic to the ground, and he was booked for the challenge. The Tigers players wanted a red card, but Clattenburg produced a yellow. Perhaps a little fortunate for Gibbs, but there was a fair distance between Markovic and the goal. Diomande for Hull had a header which he sent over, but Arsenal were looking to extend their advantage and they wrapped up the points when Alexis was sent racing clear. Eldin Jakupovic came out of his box to close him down and he was rounded. 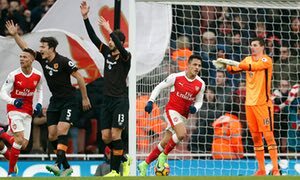 Alexis crossed into the box for Lucas and the Spaniards header was blocked on the line by Sam CLucas’s arm. Red card for Clucas, and Alexis finished low under the Hull keeper from the spot to allow Arsenal to relax a little after Hull had huffed and puffed to gain an equaliser. He has his detractors, but his display against a far larger opponent in N’Diaye. He tussled and never allowed the physical superiority to become a factor. He was a complete engine. In a tough game where the second balls are the decisive factor, a terrier like Coquelin will thrive. A run in the centre of the side, and The Ox is coming good. He still tries the elaborate when there is no need, but he helped at both ends of the pitch and if he continues to show this sort of form, he may just earn this spot for longer. He must start against Bayern. Great to see. The German looked knackered, and he ran his socks off. He just has no discernible form to speak of. His touch is unusually errant, his passing is not laser-guided as he is capable of – and he is not making the difference. Maybe a bigger stage is what he needs, and with Bayern Munich our next opponents, it would be a great time to find his feet again. Dropping deep and getting more of the ball is great, but we want you in the danger zone Mesut. He was battered, but Koscielny does not falter. He is the French Terminator. He was excellent in the many aerial duels, and on a few occasions, his fantastic positioning was key to cutting out some dangerous low crosses. He will be far busier on Wednesday, but it is good to see at least one of our players at their peak. Cech earned his clean sheet. Petr Cech cleared the ball about ten times in this game, and there was no sign of last weeks calamitous effort that gifted Cesc Fabregas Chelsea’s third goal. He made two saves of note, and they were at key times of the game. They were good saves too, particularly the second, which was a smart low save from Niasse. He can still move, regardless of the doommongers who say he is finished. There was a lot more going on, such as Iwobi looking busy and Bellerin showing no ill-effects from his injury last week. The five points above hopefully paint the picture of the game a little clearer. The game transpired to be a tale of two handballs, and even though there was a slice of luck involved, be under no illusion that we deserved the win. So, onward to the Allianz Arena. We are back to winning ways, but this Euro tie is a distinct step up, so we must rise to the occasion. Today was simply a job done that top clubs do every week.